Flies are a general annoyance but they also present a danger to your horse. Whether you are dealing with face flies or the much more serious stable flies, horse flies and even deer flies, you will need to have a pest management plan to combat them. Probably the first step in any kind of elimination program is the goal in preventing the next generation of flies from occurring. To inhibit breeding you will need to control the moisture in your stable as well as the manure. This translates into daily stable duty chores involving the removal of manure as well as uneaten feed. The manure should be spread very thinly to have it dry out quickly which will further destroy the habitat for fly larvae. These steps notwithstanding, you will still have to deal with the flies that do manage to breed. Since some flies – mostly houseflies - lay their eggs in your horse’s stool, you may add feed-through products which will effectively impair the flies’ favorite breeding ground by sterilizing it, thus killing off any hatching larvae in the manure. The feed-through itself is non-toxic to the horse, but it will have a distinctive effect on the flies. It is imperative that every horse in your barn or pasture will eat this substance, since otherwise the flies will simply zero in on the untreated animals. Other kinds of flies will prefer other living environments. For example, stable flies prefer to breed in manure that is combined with straw, but also in wet straw, grass clippings, moist soil, and even grain. Since these kinds of flies are hard to control, some horse aficionados have begin to utilize parasitoids, minute wasps which do not bother horses or people, yet effectively decimate the fly population by using the larvae as a food source. If you choose to go this route, you will need to ensure that they parasitoids population remains high to combat the flies, which generally means replenishing them. Whatever flies do manage to make it past those little wasps need to be captured with bag traps that are laced with a fly attractant and which will capture large number of these insects. These fly traps come in many varieties, so be sure to use the kind that will work best for you. Generally speaking, the disposable kind may be the best route to go. Last but not least in your attempt to control the fly population should be the use of insecticides. The goal of the entire fly management program is to have as few flies left to kill as possible. You will need to be cautious around your horses and it is a good idea to read the manufacturer’s label and follow the directions closely. Once again, there is a wide variety of insecticides available; there are topical sprays, foggers, and also misters. Some come in the form of strips laced with insecticide but they may not be safe to use in enclosed areas. Fly bait will work on the insects that do not feed on blood – as is the case with stable flies – thus it will only work on house flies. Another important method of fly management is proper weed and vegetation control. Whatever insecticide you may decide to use, make absolutely certain that it is labeled for the use around horses, and that it is safe to use on bedding, inside stables, inside enclosed areas, or wherever you will plan to use it. 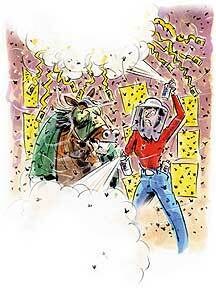 A final mode of control program involves repellants that are applied directly to your horse. These may take the forms of shampoos, lotions, and other kinds of applications that will bring the repellant in contact with the horse. Effectiveness of the repellant depends in large part on its staying power; the latter depends on its base substances. For example, oil based products may stay on longer than water based repellants, and so you will need to be aware how often you will need to reapply the substance. Mechanical repellants include clip-on repellent strips that are attached to the bridle, fly masks, and also fly shakers. Read the next horse care article on Equine Insurance - Do You Need It?